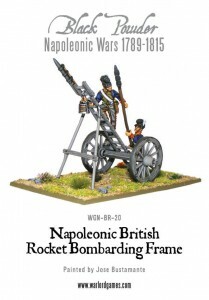 Warlord Games has a new Rocket Bombarding Frame available over in their webshop for their Black Powder range. Something new and a little different for Napoleonic players this week – the British Rocket Bombarding Frame! Rocket Troops were at Quatre Bras and Waterloo and, although Wellington viewed the rockets’ uncertain behaviour with considerable distaste, he was aware that their 2,000 metre range was acceptable and that they had a distinct demoralising effect on enemy troops receiving these formidable projectiles.